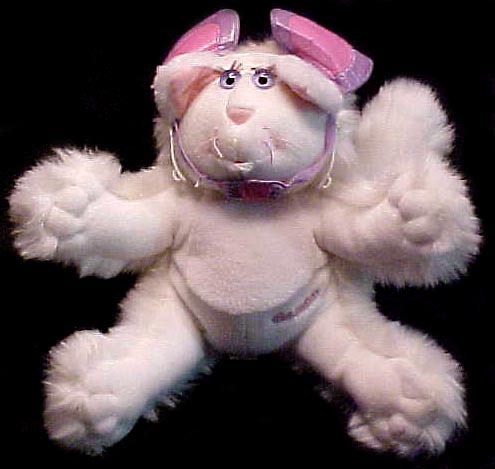 Description: Scamp-Purr is a white plush cat from the Fisher-Price Purr-tenders product line. All of the Purr-tenders are plush cats that really purr when hugged or squeezed. They have a battery-operated unit inside that make a purring noise, and makes the cats feel as though they are really purring. They were also sold with a costume or disguise to pretend to be something else. Scamp-Purr was sold with a mouse disguise, complete with a headband with mouse ears and a mouse nose. The battery unit requires one AA-size battery (included) Designed for children ages 3 years and older. FPT13016 - Scamp-Purr - White plush cat with short white fur on her face, arms, and legs, and long white fur on her tummy, tail, and back (including the back of her arms and legs). She has blue clear plastic eyes and long eyelashes. She has the word "Purr-tenders" embroidered on the lower left side of her tummy. She has an opening in her back with a Velcro closure. The battery operated "purr" unit fits inside. When the unit is removed, Scamp-Purr is machine washable and dryer safe. FPT13001 - Battery-operated "purr" unit that make a "purr" sound and a vibration motion. This unit fits inside of the plush cat mentioned above, and makes the cat sound and feel like it's purring when the cat is squeezed. Requires one AA-size battery. FPT13017 - White plastic headband with purple mouse ears. The ears have a pink inner liner. FPT13018 - Lavender mask with straps that have Velcro closures to secure the mask around the head. The mask has a purple snout, a pink nose, and black embroidered whiskers. FPT13019 - Scamp-Purr "Purrsonality" profile booklet. FPT13020 - Sold in a 11-5/16" long, 14-3/4" high, 8-5/8" deep display box. Also sold in #8400 Purr-tenders Assortment. Purr-tenders is a trademark of Hallmark Cards, Inc. and is used under license.